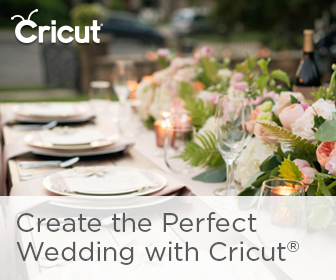 French couture bridal style and the magic of Paris takes center stage in this romantic destination elopement! 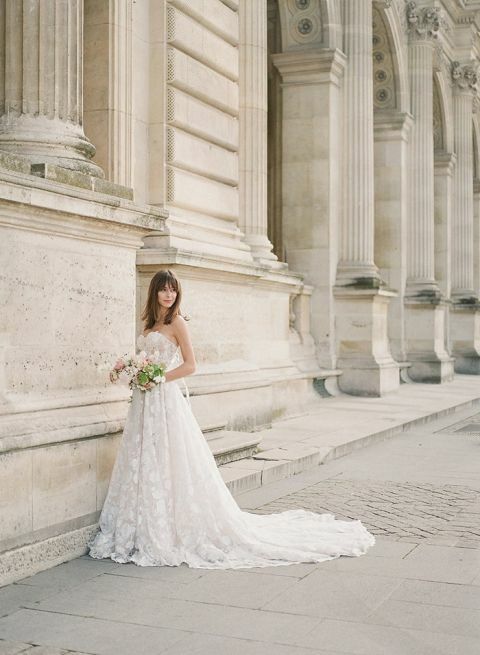 Harriette Earnshaw and The Romanticist Studios were inspired by the breathtaking architecture, art, and fashion of the French capital to create this timeless wedding shoot that captures the beauty of an intimate wedding in the heart of Paris. Glamorous gowns from Galia Lahav and Rime Arodaky embodied the chic haute couture style of the city for a once in a lifetime bridal look! The fine art film photography of Harriette Earnshaw beautifully captured the romance of Paris for this intimate destination elopement. The heart stopping beauty of the city would have been beautiful enough for real couple, Marion and Fah, to capture their wedding photos, but this incredible team went above and beyond. 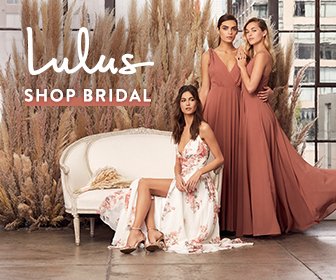 Floraison was inspired by the beauty of Paris in the spring and the intricate couture detailing on the Victorian rose pattern of the Galia Lahav gown. 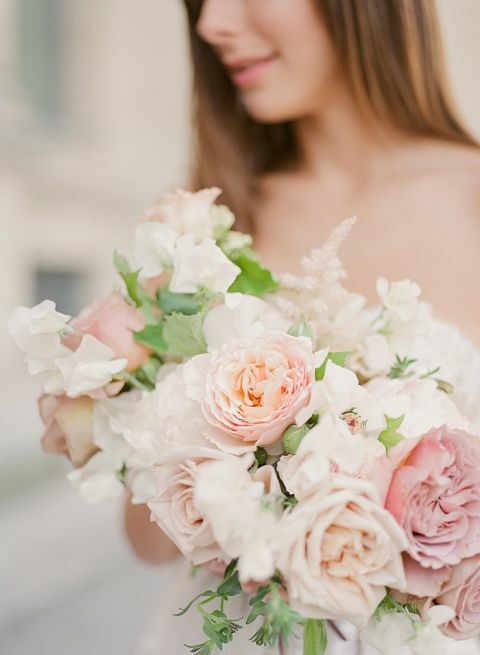 The bride carried a clutch of mauve and peach roses, ivory peonies, and blush astilbe that echoed the timeless beauty of the surroundings. From elegant colonnades of the Louvre, views of the Eiffel Tower, and an intimate penthouse reception dinner, these lovebirds drank in the sights of Paris with their photographer in tow. The amazing portraits captured on their wedding day offered a special chance to share those sweet moments for the decades of their marriage to come. For the intimate reception in their Parisian pied-à-terre, they styled a chicly French reception with lush spring flowers, silk ribbons, and petite bud vase centerpieces. The bride’s high fashion Rime Arodaky reception dress offered the perfect couture touch with a ruffled peplum skirt and intricate baroque lace pattern!